A stylish portable massager that integrated with Shiatsu Massage to relieve aches, fatigues and tensed muscles on your neck and shoulder at anytime. With 2 massage intensity levels for you to adjust to your personal preference. Massage heads are rotating 360° to deliver even quicker massaging effects that feel like a real hand massage. Easily switch the massage function and heat function with just one button. 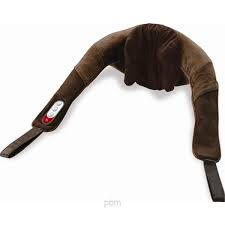 Designed with a set of wrist strap to help you position your massage right to the stress points. · Relaxes tensed muscles and relieves stress.